Johnson & Johnson’s Aveeno, in partnership with Quotient Technology, leverages digital promotions to shed light on consumers’ buying habits. EnsembleIQ’s Steve Frenda, a passionate retail watcher for more than four decades, gives us a look at IKEA in Schaumburg, Illinois. 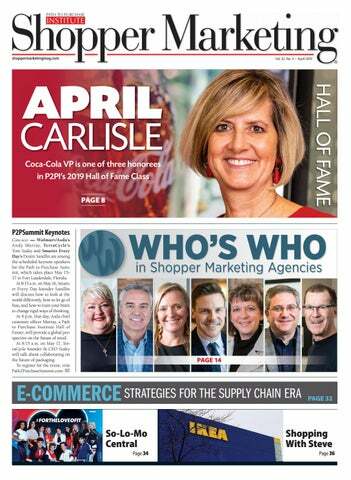 8 Hall of Fame Q&A: April Carlisle April Carlisle’s title is VP, shopper marketing, for Coca-Cola, which is no mean feat, but it still doesn’t begin to describe the breadth and depth of her contributions to marketing over the past 30 years. She recently sat down with Shopper Marketing to discuss her career and May induction into the Path to Purchase Institute Hall of Fame. Our eighth annual report highlights more than 200 agency executives with profiles of individuals from Arc Worldwide, Collaborative Marketing Group, Epsilon, HMT Associates, The Marketing Arm and Propac Marketing. Petco surfs the rising tide, rolls out a new campaign as it removes pet food/ treat products that fall below nutrition standards. E-Commerce Strategies for the Supply Chain Era In our virtual roundtable format, six e-commerce thought leaders discuss “the supply chain era” and other key strategies as they relate to the future of e-commerce. Station A, P.O. Box 54, Windsor, ON N9A 6J5 or Email: cpcreturns@wdsmail.com CHANGE OF ADDRESS and other circulation correspondence should be mailed to: Shopper Marketing, PO Box 3200 Northbrook IL 60065-3200, or email ensembleiq@e-circ.net for customer service. (Include your address label with all correspondence.) WHERE TO WRITE: Please direct all letters to the editor and other business/advertising correspondence to: Shopper Marketing, 8550 W. Bryn Mawr Ave., Suite 200, Chicago, IL 60631-3731. REPRINTS, PERMISSIONS AND LICENSING: Contact Wright’s Media at ensembleiq@ wrightsmedia.com or (877) 652-5295. NOTICE: The Path to Purchase Institute occasionally uses the logos of various companies in its marketing materials. These include promotional brochures for events such as the Path to Purchase Expo, the Path to Purchase Summit, the Design of the Times Awards and others. The use of these logos does not imply sponsorship or endorsement by the companies identified by those logos, unless specifically noted as such. Effies, the On-Demand and Digital Printing Pavilion, League of Leaders, the Retail Commission on Shopper Marketing, and of course, the Path to Purchase Institute, to name just a few. But something even bigger and more fundamental is going down this time. My colleague, Peter Breen, often points out that the wisest consumer goods companies are already doing two big things: 1) Transitioning from a product-centric to a consumer-centric focus; and 2) Adopting enterprise-wide strategies in order to develop demand-responsive capabilities. This is a game-changing shift that’s way, way more involved than just getting your CMO to play nice occasionally with the retail execution team. Coca-Cola, for example, seems to be rising to the challenge, creating a new digital integration office and a senior-level officer to implement best practices for advancing digital integration across its system. The term “shopper marketing,” while still very much an element of the Institute’s community and its coverage mission, will be insufficient going forward to describe all of the product development, analytics, retailer collaboration and consumer engagement challenges that CPG companies need to align around. What’s really going to be interesting is to see what SM rises in its place. Stay tuned. Bill Schober is editor emeritus of the Path to Purchase Institute. He can be reached via email at: bschober@ensembleiq.com. in loss of speed to market, wasteful spending and less effective campaigns. Second, most campaigns aren’t being optimized for their end destination. They are onesize-fits-all, running similarly across all locations regardless of geography, store type or shopper demographic. There is no hyper-localization. No optimized creative. No data-driven strategy. The result is sub-optimized communications investment with a brand message that isn’t tailored to the target consumer. At The IMAGINE Group, we offer broad technology platforms, measurement capabilities and shopper insights that are answering these questions for our clients. This holistic approach helps our clients optimize their visual communications platforms, drive positive consumer outcomes and deliver significant improvements in their return on visual communications. Not a Path to Purchase Institute member? Join the 400+ companies who rely on the Institute every day for strategies and best practices on succeeding in today’s chaotic consumer goods environment. For more information, contact Katrina Lopez at klopez@ensembleiq.com. Our scale, behavioral expertise and partnerships make us the leading choice for CPG brands and retailers worldwide. We solve problems…whether demystifying the spirits category, reinvigorating the frozen aisle, conveying new reasons to believe in health and beauty care or experiencing “all sides of a product” in the ecommerce space. Sound familiar? Give us a call to learn more. New York-based Nielsen, and NPD, Port Washington, New York, are building a large-scale, comprehensive omnishopper consumer panel to bring insight into today’s shoppers across all channels, all products and all categories. The panel will connect to multiple consumer data sources to comprehensively track shopper behavior online and offline across all products and categories. The approach will increase data granularity by leveraging Nielsen’s and NPD’s deep product reference data and retail market measurement truth sets to deliver accurate omnishopper insights that enable progress. OSI Creative Wraps Purchase of NDR: OSI Creative, a provider of global supply chain managed solutions for P-O-P displays, consumer product packaging and branded merchandise programs, has completed its previously announced purchase of the assets of New Dimensions Research Corp., a Long Island, New Yorkbased full-service designer and manufacturer of dynamic displays and merchandising for leading consumer brands. “Expanding our presence on the East Coast is a significant step in OSI’s business strategy and we look forward to continuing our fastpaced growth,” said Joe Baksha, president and CEO of Irvine, California-based OSI Creative. Baksha said the NDR employees joining OSI will continue working from NDR’s existing facility in Melville (Long Island), New York. Breaktime Debuts Personalization Engine: Bostonbased Breaktime Media launched a new personalization engine that allows shoppers to receive dynamic and customized content and offers based on how they interact with other content. The engine gives CPGs the ability to efficiently run one campaign designed to speak to a variety of different shopper needs, demographics and life stages. The product can recommend the proper product solution and present a compelling offer in a complex category, or easily identify recipes based on dietary needs and preferences. It will allow CPGs to accomplish the growing need for personalized content with their shoppers in the pre-shop phase of the purchase journey, said Josh Ginsberg, Breaktime Media executive vice president. MOjO Celebrates Collaboration Center: MOjO Marketing has opened its Creative Colloboration Center in Bentonville, Arkansas. The center became MOjO’s base of operations after the agency outgrew its previous space due to continuous business growth. The center was custom-built to create an atmosphere for the team to work hard but also have fun. The modern and versatile space contains elements of reclaimed materials salvaged from Walmart trailers. It also has breakout collaborative spaces to inspire creativity and innovation. MOjO can handle various creative needs at the center for its clients, including on-site photography, video production, special events, staging and print production. See MOjO Marketing’s “Who’s Who” profiles on page 26. Send your solution provider news – new projects and programs with brands and retailers – to Charlie Menchaca at cmenchaca@p2pi.org. house creative agency, to develop creative assets that were leveraged throughout the campaign. Key partners included Walmart, Target, CVS, Walgreens and Rite Aid. The videos, sourced from Aveeno brand teams, appear on product pages on Aveeno’s website and its YouTube channel. “We leverage some of our YouTube content in our activations with Quotient,” Price says. “These include product videos, creative ads and how-to content.” Campaign results were impressive: The Aveeno brand saw penetration lifts of 439% to 789% for those engaged with the promotion versus those who did not, driving positive incremental sales. The average engaged shopper spent $0.80 to $1.29 more with the Aveeno brand when compared to the matched control shopper – those Aveeno buyers who didn’t download a coupon. “Our 2019 plans are still in development, but we are looking to include in-store elements such as sampling efforts, demo events, displays that leverage the same creative as our digital activations, and other retailer-specific programs that live in each retailer’s custom ecosystem,” Price says. “J&J and the Aveeno brand are leading the way in leveraging analytics to understand how digital promotions drive consumer engagement and incremental sales,” says Blake Burrus, Quotient senior vice president of analytics. “We look forward to continuing our partnership and utilizing our data and measurement solutions to optimize digital executions and create engaging experiences that SM deliver profitable growth.” BRAND: Aveeno KEY INSIGHT: Only 25% of Aveeno shoppers purchase in more than one category across the portfolio, which includes body lotions, facial moisturizers and treatments, sunscreens and cleansers. ACTIVATION: The brand deployed seven digital offers via the apps and websites of key mass, drug, dollar and grocery retailers through the Quotient Retailer iQ platform. Additionally, videos appear on product pages on Aveeno’s website and the brand’s YouTube channel. and influence purchase decisions along the way by delivering in the moment, relevant messaging. Digital solutions that drive incremental store visits and sales, guaranteed. GroundTruth is the leading location platform for driving visits. Using its proprietary Blueprints technology, GroundTruth is able to learn about mobile users and reach them at the right place and right time, ultimately helping companies inform their marketing decisions, increase sales, and grow their businesses. Vice President, Shopper Marketing, Coca-Cola Co.
pril Carlisle’s title is VP, shopper marketing, for Coca-Cola, which is no mean feat, but it still doesn’t begin to describe the breadth and depth of her contributions to marketing over the past 30 years. She’s been an industry speaker, classroom educator, innovator, pioneer and all-around agitator for getting shopper marketing that proverbial “seat at the table.” One little known fact: Years ago, she was the prime behind-the-scenes contributor to the Path to Purchase Institute’s very first wall chart, “The Retailer Receptivity Guide,” a project that has helped countless executives in their day-to-day work ever since. Today she leads shopper marketing across the entire portfolio of Coca-Cola brands, developing strategic vision, plans and measurement – which includes shopper marketing plans with customers; shopper marketing insights, strategies, and toolkits developed with brands from the center; managing budgets and 50-plus field-based shopper marketers that are embedded in the key customer teams; and the shopper marketing vision/strategies/governance for the 64 Coca-Cola bottlers. On May 16, Carlisle – along with Jody Kalmbach, VP, digital experience, The Kroger Co.; and Peter McGuinness, chief marketing & commercial officer, Chobani – will be honored at P2PI’s 26th Hall of Fame induction ceremony, held in conjunction with the Shopper Marketing Effie Celebration in Fort Lauderdale, Florida. Both events are part of the Path to Purchase Summit. In February, Bill Schober interviewed Carlisle at Coca-Cola’s headquarters in Atlanta. CHEERS TO YOU Congratulations to April Carlisle on her induction into the Shopper Marketing Hall of Fame. Thank you for refreshing the world, inspiring moments of optimism and happiness, creating value and making a difference through your remarkable contributions to our industry! storytelling. For example, whenever somebody ordered a Moon Pie dessert, we had to pull a little Radio Flyer cart out and go tell the Moon Pie story. I got really good at it, and the other waitresses would tip me extra if I’d do it for them. Your plan was to become a teacher. What happened? CARLISLE: I started down that path, attending Ball State, one of the top elementary education schools in the U.S., with a focus on hearing-impaired children. I was actually “Future Teacher of the Year” at Ball State. In my senior year, I was student teaching and busy with other activities like student senate when, out of the blue, I received an invitation from the campus recruiting center to interview with Procter & Gamble. My roommate dared me to go. I didn’t do any research – nothing. Why do you think you got the letter? CARLISLE: Back in the 1980s, the P&G recruiters didn’t care what your major was. They’d come on campus and ask professors who were the leaders on campus. P&G’s first interview involved taking a test with a lot of sales math. I passed that and then a series of interviews and eventually got an offer. I think my father, who is very traditional, wanted me to stick with teaching, but he wrote me a letter that said, “I will support you in whatever you want to do.” So here I am. I guess I wanted a challenge. Well, I got one: On June 20, P&G said they had an immediate opening for a sales territory in downtown Chicago – 300 stores, company car – but I had to start within 10 days. Thrown into the deep end . . .
days was male and, yes, there were a lot of crude jokes. P&G had a very strict dress code, so I wasn’t allowed to wear pants; everyday it was a suit, long skirt and bow tie, and I even did overnight resets in high heels. I learned how to work the baler in the back room and build displays. I was battling it out with Colgate-Palmolive, getting my space and discovering that I absolutely loved retail, learning about shoppers and persuasive selling. I doubt they do orientation like that these days. CARLISLE: There’s a lot to be said for getting your hands dirty. If you just tap away on computers all day you miss the retail realities. Back then, you not only took orders manually, store by store, but you also had to do things like convince store managers to buy into promotions and put up their endcap displays. My first division was healthcare – Crest, Scope, Pepto-Bismol. You had to memorize the codes for every SKU so you could call in orders on the CodeA-Phone. I’d be in downtown Chicago, in the middle of winter, running around in high heels looking for a phone booth to punch in digits: “Okay … store 6275, 30 cases, order number 2567,” which might be Crest toothpaste fluoride with mint or something, and so on. I started as a sales rep and worked my way up to MFR – manufacturer field rep – which was kind of like being a manager in training. I then became a unit manager with a team of eight sales reps that called on Chicago territories, and eventually was calling on Osco Drug headquarters. At the time they were the third largest drug retailer in the U.S. Later I took on regional responsibilities for Osco, Sav-on Drugs and Jewel along with an expanded portfolio of products that included beauty and baby care. I‘d be well-suited for shopper marketing. Apparently I’d impressed her while working on a Vicks VapoRub promotion for Osco. They wanted me to sell in an endcap with a bunch of Vicks stuff on it, but I’d argued with them: “Wait a minute, what’s the shopper insight? Why is this right for Osco? Because that’s the only way we are going to get this sold in.” So I am forever grateful to her. But honestly, I had no idea what the job would entail. Shopper marketing as a discipline was still getting up and running. Dina Howell had just moved to Arkansas to manage the Walmart team working with ThompsonMurray, which would later evolve into Saatchi X. But P&G put me through the company’s marketing boot camp, and I shadowed brand managers to learn their marketing sensibilities. I had that shopper marketing role for three years, and then it was time for a change. through her. I’ll never forget the first time she took me to Google and we could see, early on, how they were going to change things. and-mortar, you must build the brand’s equities and the retailer’s equities at the same time. Yes, a lot of work right now is around building brand equities within the context of a customer’s touchpoint – Amazon, right? And yet the best shopper marketing work is where you are helping the retailer build trial or loyalty. When done right, the power of your brand can facilitate that, and without diminishing any of your brand’s equity. Actually, I believe that the best term is “OmniCommerce.” When you go down omnichannel routes it becomes very tactical: I have to stay within this channel or talk to you on TV or just focus on this or that. But “OmniCommerce” is what shopper marketing does; it’s thinking through all of those touchpoints, whether they’re coming from the brand or from the retailer, and converting. It is a behavior change at retail. nected with shopper marketing colleagues who were now getting placed throughout the industry, like Remi Kent, marketing director at 3M – our first project together won a Reggie – and Stephanie Robertson, who was taking over as shopper lead at P&G. I would help on pitches because I still like to sell. So when Nick Jones moved to Geometry, I took over new business development for Arc, reporting to Katie Newman, who is the CMO of Leo Burnett, and we’d pitch together. Northwestern as an adjunct, he noticed a void in the curriculum and built a class framework for shopper marketing. Later on he reached out to Arc for some help with content and Elizabeth Harris helped build the first case studies using real world clients such as MillerCoors. Tim saw me speak at an industry conference and asked me in as guest lecturer. The next semester I helped him teach the class. He then decided to do some other things, so Elizabeth and I now share it. We revamped it a bit to put our spin on things, and have been teaching for three years in the fall and spring semesters. I hear it’s expanding. How so? CARLISLE: When we first began teaching, it was classified as a “special topics” class. But last year, after a peer review, it was elevated to the full-time curriculum within Medill’s Integrated Marketing Communications (IMC) program, which is an honor. We were also asked to develop a live, online version of the class, so right now, every Wednesday night, I’m teaching students from all over the globe. As far as we can tell, this is the first graduate-level shopper marketing class in the world. How did Coca Cola, after 30 years in Chicago, get you to move to Atlanta? CARLISLE: Coca- Cola was my client, and when they told me they were looking for a shopper marketing lead, well … I don’t drink coffee; I drink a Diet Coke every single morning, and I’ve been doing that since I was 18 years old, so you can imagine how I felt. When I told my husband, who is 100% true-blue Chicagoan, that it would involve relocation, he was immediately receptive; he knew what the opportunity to shepherd Coke, arguably the world’s most iconic brand, would mean to me. So I started the formal process, interviewed and was offered the job. My last day at Arc was April 6 ; I flew down to Atlanta on Sunday, April 8, and started on Monday, April 9. I always tease Coke people about whether they secretly like Pepsi. CARLISLE: I grew up in a Coke family, and I can say with confidence that I’ve never ordered a Pepsi in my life. I’ve driven a Coke red car for five years, carry a Coke red suitcase and, right now, I’m wearing Coke jewelry. My daughter has a Coke can collection from all of my travels around the world, and when I accepted the job, she posted it on Instagram and said, “It was meant to be.” Well, you sure landed in the right place. What is your role here today? CARLISLE: My primary responsibility is to show the strategic vision of shopper marketing for the total system. The system is defined by our customers, and there are retailer call points that we own and call points that the bottlers own. Some of our shopper marketers also sit at the bottlers for certain kinds of regional work. I’m charged with embedding shopper marketing thinking and expertise within our brand, which we call the “Strategic Marketing Organization,” as well as within the Commercial Team and the internal marketing communications organization as well. One of the things I’ve focused on over the past nine months is setting forth a “Shopper Marketing 2020-2025 Vision.” It’s a vision for our system: Where we need to go and what capabilities we’ll need given emerging challenges such as search via our customerowned platforms, click-and-collect, or defining and measuring what’s true shopper marketing versus promotional activity. that with the customer and their shopper base. A typical challenge might be, for example, how convenience retail is changing. It’s traditionally been a huge recruitment channel for teens when they get their driver’s licenses – the first thing they want to do is fill up the tank, and go in and get a Coke, right? Well young people are Ubering everywhere now, so that’s becoming a declining point for recruitment. So we need to be rethinking the role of the convenience channel; how can we sell teens smartwater with their fresh-to-go salads and things, or a 2-liter with take-home pizza? Once we’re aligned on insights and growth strategies, we bring on the marketing campaigns and brand plans because we are planning a year in advance. I then steward this entire playbook through all of the brands to get their alignment, so we can fund all of these programs. We also take retailers over to Coca-Cola’s collaboration center, the “KO Lab,” to present the innovations we’re coming out with: flavors, snacking platforms trip and transaction drivers. We mock everything up virtually and walk through the store and the various points of inspiration we can create to drive traffic through mobile and digital. What does Coca-Cola see ahead in its dealings with Amazon, pure-play retail, and digital commerce in general? CARLISLE: We have announced a new digital integration officer at a senior level, so the pure-play retail and e-commerce work will fit into that. I’m already working hand-in-hand with the digital integration office on best practices for advancing digital integration for the system. By 2020, and that’s next year already, 20% of stores will have click-and-collect, and in that environment you don’t see our brand wall, our instant consumption cooler, our beautiful endcaps. How do we get the impulse purchase? Hershey’s has the same problem. Maybe as you approach a grocery pickup area you’ll get a push notification for a cold Coke for the drive home. Maybe we can work with our bottlers to install cooler equipment at pickup lanes – type in a code and pick it up? Are there any programs that you are particularly proud of? CARLISLE: Coca-Cola’s “Make Every Sip Count” platform. The Boys & Girls Club of America is very important to Family Dollar, and while at Arc, my team helped develop this wonderful platform, which donates a percentage of every purchase and leverages celebrities from the Coke family. The Coke shopper marketing team was named “Marketing Vendor of the Year” for Family Dollar and it’s up for an Effie award this year. But most importantly, this is a sustaining platform – it’s not a one-and-done. Your daughter is in the business. CARLISLE: She’s a first-generation shopper marketer. Any final thoughts? CARLISLE: They say “luck is when preparation meets opportunity,” but there’s a whole lot of hard work involved. I love to story-tell, I love to sell, and I love to shop. So, yes, I was lucky – I found my passion point, shopper marketing, and I love to share it SM with others. Next month Shopper Marketing magazine and Consumer Goods Technology will unite to bring a stronger voice to the industry. in Shopper Marketing Agencies Our eighth annual report recognizes more than 200 dedicated, passionate agency executives whose creative, intelligent work is not only helping brand and retailer clients achieve success but pushing the discipline of shopper marketing to new heights. FUTURE The retail landscape is one of constant change and evolution. What gets you shoppers today might not get you shoppers tomorrow. You need an agile and capable partner comprised of thought leaders and innovators, shaping and determining what tomorrow has in store. That’s where we come in. Let’s connect. ADVANTAGE MARKETING PARTNERS JILL GRIFFIN, President Griffin leads the collective of agencies with an unmatched service offering, bridging the gap between sales and marketing, retailers and manufacturers, and consumers and shoppers, driving premium value for each party. MICHAEL HARRIS, Executive Vice President, Strategy and Development With more than 25 years’ experience in advertising and marketing, Harris has led agencies on two continents and developed campaigns working with the world’s finest brands. He has been responsible for strategy and development at the agency since 2015. LISA KLAUSER, President, Enterprise Client Development Klauser is a 23-year consumer packaged goods veteran with marketing and sales experience in personal care, beverages and food. She spent 19 years at Unilever, where she led a team of more than 250 CPG professionals. Prior to her current role, she was president of IN Connected Marketing. BRIAN KRISTOFEK, President, Advantage Consumer and Shopper Marketing Kristofek has believed in the power of shopper marketing from the start, working with pioneers like P&G. He’s actively involved in growing Advantage Consumer and Shopper capabilities, including business arts and digital innovation along the shopper journey. ANDREA YOUNG, President, Advantage Customer Experience Group Young oversees operations across six agencies, 19 U.S. retailer agency of record appointments, and more than 10 key national client relationships and brand businesses. She joined Advantage after more than 15 years working with Omnicom Group of Companies. ARC WORLDWIDE CHRIS CANCILLA, U.S. Chief Creative Officer Cancilla oversees the creative craft and effectiveness of work produced for the agency. He has more than 20 years’ experience building award-winning work and has created work for the likes of Kellogg’s, McDonald’s and Visa. KYLE CLEARY, Senior Vice President, Account Director Cleary has more than 18 years’ experience developing and executing break-through retail and promotional marketing campaigns for global brands including Pepsi, Gatorade, Reebok and SC Johnson. He currently is the business lead on MillerCoors. MATT DENTEN, Executive Vice President, Creative Director Denten has more than 25 years’ experience in design communication, shopper marketing, retail design, promotions, brand activation and experiential event marketing. He leads the creative team for Dunkin’ and heads the Arc Worldwide Retail Design Group. ELIZABETH HARRIS, Chief Strategy Officer, North America Harris directs insights and strategy for brands such as MillerCoors and Intel. She has broad experience in marketing with a sharp specialization on retail, shopper marketing and brand strategy/insights. LAUREN HAWES, Vice President, Strategy Director Hawes leads strategy across a number of businesses at the agency. She is a lead architect behind Arc’s proprietary research tool, ShopperScopeSM. She is also the founder and co-leader of the agency’s employee resource group for parents, ParentKind. SOCHE PICARD, Chief Executive Officer, North America See profile on page 22 DANA STOTTS, Senior Vice President, Director of Channel and Customer Strategy Stotts has more than 20 years’ experience working with world-class clients and retailers. He currently leads channel and customer strategy for Arc and is responsible for inspiring integrated, commerce-driven solutions for his clients. MATTHEW WEINER, Senior Vice President, Group Creative Director Weiner leads creative across MillerCoors. He’s worked across many categories, disciplines and agencies. His love for drinking beer has parlayed into a love for selling it and is inspired by the ever-changing landscape of commerce. AVID MARKETING GROUP MIKE DEMATO, Vice President, Client Services DeMato brings more than 20 years of shopper marketing and brand-building experience, leading the account services team at AMG. His core expertise revolves around crafting strategy and execution direction for successful pre-store and instore programming. DEANNA DRAPEAU, Managing Partner Whether developing an integrated shopper marketing strategy or launching multifaceted digital campaigns, Drapeau and her team strive to produce tangible increases in brand visibility that drive customer engagement, sales and increased revenue. JONATHAN GROSS, Senior Partner Gross founded Avid in 1986 to perfect the strategy and processes that allow its clients to promote their brands, engage their customers and increase revenue. He brings a wealth of experience in making sense of the varied marketing tactics available to create a comprehensive, customized and effective program. KEN KRUPA, Vice President of Analytics and Business Performance Management Krupa leads AMG’s analytics team and is responsible for evaluating program performance to identify key insights and provide client strategy recommendations for more informed, effective and efficient shopper marketing promotions. BARD ADVERTISING BARB STABNO, Founder and President Stabno has more than 25 years of experience in shopper marketing. She is responsible for the overall management of the agency and leads the strategic team. She also oversees Connect1-1, a printat-home coupon platform that allows partnering agencies complete control to build and manage coupons with access to real-time data across both social and display media. experience guiding brands on digital investments accomplishing both marketing and business objectives. She oversees the strategic direction, implementation and optimization for all digital work done to support the agency’s clients. JOY MEAD, Executive Vice President and General Manager, Business Leadership Mead has more than 30 years of CPG industry experience. She has expertise in a variety of capacities including customer business development, category management, shopper marketing and brand leadership. Mead leads Blue Chip’s business leadership teams on P&G, Butterball, Bausch & Lomb and Wells Enterprises. JAMIE OLSON, Senior Vice President, Business Leadership Olson has more than 15 years of experience helping manufacturers like Bausch & Lomb, McCormick and Kellogg’s motivate shoppers through value-added experiences. She understands how to take brand strategy to the store level and unite shoppers to purchases. PAT TAFLINGER, Senior Vice President, Intelligence With more than 20 years of industry experience, Taflinger leads Blue Chip’s strategy, analytics, modeling and resources capabilities, with a passion for results and attribution. of experience leading and building cross-functional teams across diverse brands and categories. improve marketing efforts across digital, social, shopper, CRM, promotional and experiential marketing. are translated to marketing KPIs that are measurable and have long-term impact on brands. JOHN MEYER, Vice President, Client Partnerships Meyer leads new business development and client partnerships for the agency. He has more than 20 years of shopper marketing agency leadership experience and has worked with leading brands across all retail channels. ALYSON TARDIF, Owner, Managing Partner Tardif has more than 20 years of through-theline marketing experience. She adamantly stays involved with clients’ business, ensuring they get the best from start to finish. She also takes pride in providing her team with the support and resources required to deliver the best for every individual client need. BRAVO GROUP MARCOS MOURE, Vice President, Creative Director Moure, a 20-year marketing, advertising, digital and shopper guru, is Bravo’s creative lead across the full shopper marketing portfolio. His strategic approach, creative brilliance, and contagious passion infuse Bravo’s shopper marketing expertise. JOE LAMPERTIUS, Executive Vice President, Practice Lead Lampertius leads the shopper practice and growth across Chase Design and Momentum. it’s about making your brands the hero. PETER LYNCH, Executive Vice President, ShopperBased Design Lynch has decades of shopper-based design experience within Chase Design. DONNALYN SMITH, President, North America Smith serves as president of both Momentum and Chase Design. BRENDAN ABRASSART-WHITE, Creative Director With more than 15 years of experience, Abrassart-White is responsible for leading the creative team and developing commercial and shopper marketing programs and brand activation. His focus is making ideas even more powerful to drive conversion. to create eye-opening insights, spot-on strategies and award-winning ideas. Dedicated to delivering unparalleled engagement at every touchpoint, connecting consumers’ hands, hearts and minds with your brands is at the core of everything we do. © 2019 HMT Associates, Inc.
CHRISTOPHER DIMMOCK, Chief Strategy Officer With 26 years of marketing sciences practice including innovation, research, product development and brand positioning, Dimmock oversees all client strategic planning and marketing strategy through the agency’s global strategy and insights group, including a primary research practice. LINDA LELUDIS, Digital Account Director Leludis’ expertise spans many industries including QSR, retail and live entertainment. She has 20 years of digital marketing, content development, experiential and brand management experience working client side and agency. SUE ROSENHAIN, President Rosenhain believes in the power of play to create lasting connections between people and brands. With more than 25 years of experience, she now leads a global team delivering award-winning work to some of the world’s most iconic brands. STEVEN SAURA, Vice President, Managing Director, North America Saura is responsible for accelerating the growth and expansion of North America. With expertise in consumer goods, retail and activation, he has helped fuel iconic brands for global industry leaders for more than 25 years. CURB CROWSER DEAN FORBES, CEO Forbes’ 25 years of experience fuels his passion for retail and translates to business and creative solutions that heed results. SHANDRA ZURN, Vice President Zurn partners with clients to bring creative strategies to life at retail, resulting in both a sell-in and sell-through. EASTWEST MARKETING GROUP CRAIG MOSER, Vice President, Group Account Director, Retail Marketing Moser leads Eastwest’s in-store planning, as well as execution and digital initiatives. He has been instrumental in the launch and continued operation of the company’s retail-focused discipline. LOU RAMERY, CEO Ramery leads the agency in guiding clients to develop meaningful brand connections that maximize customer value. EDGE MARKETING STEVE DELOREZ, Group Creative Director With 20-plus years’ experience, DeLorez has led creative work for some of the world’s most popular brands and is focused on bringing their strategies to life in unexpected, fulfilling ways for consumers at every point on the shopper journey. ELIZABETH FOGERTY, Executive Vice President, Chief Strategy Officer With 25 years of integrated marketing experience, Fogerty’s history of performance-driven results speaks volumes. Responsible for developing fact-based, insight-driven strategies, her team inspires great creative that motivates consumers to take action. MARCELLA OGLESBY, Vice President, Creative Director Oglesby has more than 16 years of experience in the design industry, ranging from fashion design to interior design to graphic design. She and her team develop strategically sound, breakthrough creative for shopper marketing campaigns and consumer engagements. MICHELE SHIROMA, Vice President, Client Services Shiroma has been with the agency for 15 years, working between brand and customer-facing roles. She has led the field in developing strategic shopper marketing plans grounded in insights across CPG brands, including Unilever and Smithfield. This is how partnership adds up. 20 WHO’S WHO IN SHOPPER MARKETING AGENCIES ALLISON WELKER, Executive Vice President, General Manager Welker brings 18 years of traditional agency experience with a heavy shopper marketing influence, where she helped companies like Unilever and Newell Rubbermaid build their shopper discipline. LISA JOHNSTON, Vice President, Walmart & Club Team Leader With more than 20 years of experience in sales, strategic planning and shopper marketing, Johnston leads Epsilon’s mass and club channel teams located in Bentonville, Arkansas. Her team is focused on innovative data-driven solutions to help drive brands at retail. RON MAGLIOCCO, Executive Vice President, Client Services Magliocco and his team use the agency’s data to develop effective ideas that unlock demand for client brands at retail. For 25-plus years, he’s been a leader of shopper commerce for his team and their clients from retailer promotions to the precise, measurable nature of the discipline today. HAYES MINOR, Vice President, Strategic Planning In her role as a strategic planning leader, Hayes is passionate about the development of rich shopper strategies across brands and retailers. With 20-plus years in marketing, she’s focused her practice, specializing in behavior change for multiple Fortune 500 companies. NINA MONAHAN, Senior Vice President, Group Account Director Monahan is responsible for leading a portfolio of businesses, including GlaxoSmithKline. With more than 25 years of global integrated marketing experience, she has worked in multiple countries with a focus on building capability, growth and innovation across a range of iconic brands. CASSIE WENGER, Vice President, Creative Director Wenger leads the creative and strategy teams for the agency’s Bentonville office. With more than a decade of leadership crafting strategic creative solutions for corporate marketing, retail and brands, specializing in shopper commerce for Walmart and Club. FCB/RED TEDDY BROWN, Executive Vice President, Executive Creative Officer Brown, a visionary and experienced retail and through-the-line leader, oversees all creative teams and solutions. NICOLE EMERICK, Vice President, Social and Influencer Marketing Emerick started her career writing a blog for ambitious career women, which led to partnerships with Secret, InStyle, Microsoft and Chevy. She currently leads a full-service social media team and influencer practice. She designs solutions for consumer and shopper campaigns that benefit retailers and brands. FERNANDO ESPEJEL, Executive Vice President, Digital Platforms and Commerce Espejel drives thought leadership and the mobile, social, creative and development teams on the management of all digital and commerce platforms. He translates client goals into functional requirements for the design and development departments, serving as a bridge to technology/UX and creative. Prior, Espejel was on the award-winning mobile team at Walgreens. JAY HIGHLAND, Chief Creative Officer, Environmental Design, Chute Gerdeman Division Highland is a powerful creative leader. His ability to understand the bigger picture and elevate the experience has been a catalyst for innovation and growth. His experience encompasses all phases of the retail strategy and design process, from concept creation to store implementation for Barbie, M&M’s, Whole Foods and others. HOWARD KLEIN, Senior Vice President, Group Management Director With 20 years in the retail and brand activation industry, Klein leads client service and brings together insights, compelling shopper platforms and physical to digital business-building solutions for clients that have included Anheuser-Busch, Coca-Cola, Starbucks, RJ Reynolds, SC Johnson, GSK, Kellogg’s, Sony, Nivea and Oreo. PRADEEP KUMAR, Senior Vice President, Global Data Officer Kumar leads a team of more than 40 experts that delve into advanced analytics, data-driven marketing strategy, consumer behavior analytics, digital/social media, retail performance, loyalty management, ROI and econometric modeling, shopper choice analytics and advanced data technology. His transnational experience spans Clorox, Bank of America, Ericsson, P&G and others. TINA MANIKAS, President A renowned leader in integrated marketing and shopper marketing, Manikas is an awardwinning pioneer in the industry having grown FCB/RED into a leading global agency across CPG, tech and retail clients. She recently added leading environmental design firm, Chute Gerdeman, to the agency’s arsenal. CURT MUNK, Executive Vice President, Director of Strategic Planning The leader of insights and planning, Munk brings true retailer experience, brand understanding and relentless shopper-first thinking to every challenge. His expertise in shopper strategy, retail design, e-commerce, promotion and merchandising has helped P&G, Coca-Cola, Frito-Lay, Novartis and more. Munk is a CPG expert and sought-after speaker. GEOMETRY GLOBAL MICHELLE BAUMANN, Senior Vice President, Head of Business Analytics Baumann is responsible for leading North America performance measurement across data integration, campaign reporting and shopper impact analysis. Prior to joining Geometry, she spent eight years at Kantar Retail where she was responsible for sales and account management and, most recently, was a principal of strategic analytics at IRI, dedicated to leading analytics onsite at the top analytics client. LAURA JOHNSTON, Executive Vice President, Executive Creative Director, Chicago Creative Johnston has worked in the retail, promotions and shopper marketing world for almost 20 years. In that time, she’s fried chicken in a KFC kitchen, spent a week at Iams veterinary nutrition school and cupped coffee at Starbucks HQ – all in the interest of understanding her clients’ businesses and their shoppers. Her activation experience extends to brands in the QSR, spirits, CSD, financial services, fashion, packaged goods, automotive, telco, sports, government services, technology and consumer electronics categories. SCOTT MCCALLUM, CEO, North America Recognized as a forward-thinking leader in the commercial marketing space, McCallum has more than 25 years of experience, most recently successfully leading Geometry’s Chicago office. An advocate for new and creative ways to interact with consumers as the world grows more commercial, he is an enthusiastic collaborator with Geometry’s experiential team to create innovative and impactful brand activations that deliver compelling results for clients. KATHY HARVEY, Founder and President Harvey launched her agency in 1986 with the vision of bringing retail brands to life. For the past 30 years, she and her team have helped reinvent the way brands focus their marketing efforts, making Harvey one of the industry’s fastestgrowing agencies. JOHN MAKOWSKI, Senior Vice President and Creative Director Makowski directs and oversees all creative and digital for the agency. Most recently his work has won both the Nielsen Design Impact Award (design excellence and audited sales growth) and Communication Arts Package Design Award of Excellence. TYLER MURRAY, President, North America Murray has a proven track record of building and leading global omnichannel organizations with a focus on analytics, strategy and operational design. Most recently, he served at TracyLocke as the managing director of the Chicago office, leading multiple blue-chip clients and serving as the agency’s chief strategy officer. He also led the global digital practice for Saatchi & Saatchi X prior. GREY WORLDWIDE CHRISTINE MCCAMBRIDGE, Executive Creative Director, Grey Commerce McCambridge spent her career across client and agency roles in e-commerce and shopper marketing. She now leads the commerce division of Grey, bringing commerce thinking upstream, identifying global integration solutions and activating omnichannel strategies across clients. PETER ROMAN, Creative Director Roman is the shopper marketing creative lead for the agency with a rich background in design ranging from packaging through digital and offline activation. He is driving creative solutions and integration with ATL and retail strategy for clients like P&G. HARVEY SUE BAILE, Senior Vice President, Brand Integration Director Baile oversees and directs all agency integration of Coty client services, traffic and production. She is responsible for all upstream strategic shopper collaborations as well as end-to-end delivery with agency partners, suppliers and customer teams. JULIE HUDSON, Director, Strategy & Insights Hudson brings 20 years of account planning and shopper marketing experience to the discipline of brand engagement. She develops focused, efficient strategies to powerfully connect brands with shoppers across today’s evolving path-to-purchase. LISA NORAT, Senior Vice President, Business Engagement A marketer for 25-plus years, Norat’s shopper knowledge base and fresh, on-strategy thinking delivers results for brands, shoppers and retailers. She excels at driving shopper-focused brand engagement and innovative programs for retailers of all sizes. IN CONNECTED MARKETING VALERIE BERNSTEIN, Executive Vice President, Business Development With 18-plus years’ integrated marketing experience, Bernstein heads the new business function for the agency, overseeing a dedicated team that diversifies the client mix, identifies and incorporates new services and customizes highly flexible solutions. HENLEY COULTER, Senior Vice President, Client Services With 21 years of experience in brand building and shopper marketing, Coulter leads the IN Connected Marketing Dallas office, providing connected commerce solutions for clients such as Keurig Dr Pepper and LALA. DINO DE LEON, Executive Vice President, Executive Creative Director De Leon has spent more than 21 years disrupting the norm and designing creatively strategic solutions for worldclass brands. Clients can count on him to question, challenge and evolve every step toward a purchase. HOLLY QUINN, Executive Vice President, Chief Operations Officer & Agency Excellence Quinn is a senior marketing leader with more than 21 years of experience in shopper marketing and retail strategy with extensive experience in client relationship development, infrastructure build and operational excellence. BRYANT ROSS, Senior Vice President, Client Services Ross has nearly two decades of experience developing impactful, award-winning commerce solutions for top Fortune 500 manufacturers. He has pioneered custom, client-centric agency models and leads the IN Connected Marketing Chicago team. THE INTEGER GROUP ELLEN COOK, President, Integer Dallas and The Collective Agency, Los Angeles Cook leads Integer’s Dallas agency as well as The Collective Agency. The Los Angeles-based agency reimagines shopping through strategically crafted, customer-centric entertainment experiences utilizing authentic content and emerging technologies. DANI COPLEN, Executive Vice President, Executive Creative Director Inspiring award-winning work on billiondollar brands and retailers, Coplen leads a team of creatives to deliver strategic and holistic ideas through advertising, integrated branding, promotions and shopper marketing for some of the world’s largest and most iconic companies. CRAIG ELSTON, Global Chief Strategy Officer Elston spearheads the global development of strategic thinking in commerce at the Integer network. He also provides leadership to Integer’s connections strategy group, turning moments of receptivity into moments of conversion, and analytics capability that powers client growth opportunities. TISHA PEDRAZZINI, President, Denver With an unwavering commitment to leading clients and building business, a people-first mentality that cultivates top talent and, most importantly, a keen sense of how to lead an organization into the future, Pedrazzini has been instrumental in transforming Integer from a shopper marketing agency to a commerce agency. INTERACTIONS ANNA AKOPOVA, Account Director Akopova oversees the operations team for Interactions’ newest account, Whole Foods Market. Her team is focused on hiring, scheduling, and training staff to execute events nationwide on behalf of Whole Foods Markets’ unique brands. IT’S NICE TO MEET YOU! N O W T H AT W E’ V E I N T R O D U C ED OUR S ELV E S , W E’ D LOV E TO INTRODUCE YOUR BR AND TO BUYERS. As a FULL-SERVICE AGENCY, we put brands just like yours in positions to meet buyers every day. After all, making meaningful connections is the most important part of growing successful relationships. MEET THE TEAM ON PAGE 18. LE T ’ S TA LK S O O N! MAEGAN BOWE, Director, Sales & Operations Bowe leads a team to drive innovation and customized solutions to drive shopper engagement and brand awareness through in-store sampling. She is responsible for the launch of the nationwide in-store sampling platform at Whole Foods Market. She is also proud of developing a platform to assist local customers to drive brand awareness and shopper recognition. HEATHER CIFUENTES, Client Services Director As the fuse between business development and operational teams, Cifuentes’ passion is to create an exceptional experience for her clients. She is currently supporting the Whole Foods Market team in expanding service offerings with strategic, innovative and measurable solutions that drive results. CASSANDRA PETERSON, Sales & Operations Director Peterson has launched and managed operations for four major dedicated retail sampling programs, as well as executed many special projects in the retail space to drive execution and brand awareness for clients. JUN GROUP COREY WEINER, President and Chief Operating Officer Weiner co-founded Jun Group, an industryleading mobile video advertising company, while he was in high school, and has led it successfully for 15 years. Jun Group joined the Advantage Solutions portfolio in 2018. Lottery, Kona Brewing Co., Arby’s and more. Based in California, he manages teams in Orange County, Connecticut, New York and Dallas. BOB MOLER, Vice President, Strategic Account Lead Moler has spent more than 20 years focusing on unlocking the precise moment when buyers decide to buy. By seeking the right combination of moments, motives and messages, he drives marketplace value for the agency’s clients, including Bacardi and Goodyear Tires. MARKETINGLAB BILL BIWER, Associate Creative Director, Digital & E-Commerce Biwer keeps MarketingLab on the forefront of everything digital. His love for coding and motion graphics evolved into love for giphy stickers, Snapchat filters and bite-size movies. RICH BUTWINICK, Owner/President Butwinick has more than 20 years of experience in shopper marketing, retail marketing and promotions for leading manufacturers such as Procter & Gamble, Land O’ Lakes, Viking Range, Delta Faucets, Pilgrim’s Pride and Phillips Distilling to name a few. KATE MENDEL, Group Account Director Mendel oversees a diverse group of clients including Twin Cities Orthopedic, Pilgrim’s Pride and Bellisio Foods. Her team creates and manages the activation of shopper programs, experiential, consumer promotions, social media and advertising. CHRIS HAAS, Creative Director With more than 20 years of retail and brand advertising experience across nearly every category, Haas leads MarketingLab’s creative team with contagious energy and innovation to develop and execute creative strategy for the agency’s clients. WELLS DESCHLER, Vice President, Strategy Deschler is a veteran brand and retail strategist, leading the FritoLay business and bringing more than a decade of CPG, communications planning, consumer engagement and retailer intimacy experience. MARK LENSS, Senior Vice President, Managing Director Lenss has more than 30 years of experience in shopper marketing, consumer promotions and advertising across virtually every category. He manages MarketingLab’s business and client relationships day-to-day. through insight-driven, occasionbased channel and retailer-specific shopper solutions with an eye toward collaborative partnerships. KATIE SELESKI, Account Director Seleski has been working in shopper marketing on both the client and agency sides for the past 20 years, managing iconic brands such as Land O’Lakes, Honeywell and P&G. KEITH SHIFRIN, Account Director Shifrin has more than 22 years of experience in shopper, brand and digital marketing across categories including CPG, beverages, gas and oil and the outdoor space. He has a keen understanding of consumer shopping habits for both long- and short-term purchase funnels. MARKETING WERKS LISA FASANA, Senior Vice President, Managing Director Fasana oversees the agency’s clients with a focus on implementing strategic, innovative and measurable solutions that drive results throughout the consumer journey. She has more than 18 years of experience in shopper marketing, retail activation and brand launches. DAN MILLER, Senior Vice President, Managing Director Miller has more than 25 years of retail activation, shopper marketing and consumer experience. He has partnered with the world’s largest brands and retailers to create innovative engagement experiences and exciting marketing activations. DAVID NEWMAN, Chief Insights & Strategy Officer, Crossmark Newman joined Marketing Werks’ parent company, Crossmark, in September 2015. He leads analytics, OTC, IT and the marketing agency. Prior to CMK, he spent more than 16 years at PepsiCo. ROB REENTS, Vice President, Managing Director, Promoworks With more than 30 years of shopper, promo, digital, direct, and social media marketing experience, Reents partners with clients to create fully integrated shopper engagement programming. THE MARS AGENCY KRIS ABRAHAMSON, Senior Vice President, Client Leadership Abrahamson leads the agency’s Chicago office. With more than 25 years of shopper and consumer marketing experience, she manages a cross-functional team to create growth for her clients through bold creativity and collaboration. MICHELE RONEY, Senior Vice President Roney oversees the retail solutions team. She has spent more than 20 years helping retailer clients adopt more collaborative, holistic processes and programs that drive growth for both the retailer and the manufacturer. KEN BARNETT, Global CEO Mars Agency founder Barnett oversees an agency-wide culture of professional growth and client-service excellence. He brings more than three decades of bold marketing innovation, broad advertising experience and prolific entrepreneurial success. MICHAEL DILL, CEO Dill has more than 18 years of experience in shopper and consumer marketing. As CEO, his focus is on driving bestin-class ideas and creative solutions across all Match offices throughout North America. JAKE BERRY, Executive Vice President, Business Strategy Practice Berry oversees the agency’s business strategy practice, bringing more than 15 years of client leadership experience, consumer brand expertise and passion for marketing at all points of commerce. At CMG, we are your team. We help you focus on the right plans for your brands. And, we handle the details you need to reach your goals. CMG has a successful track record of matching up sound consumer insights, with our knowledge of the retail landscape, to provide your brands with effective and profitable Shopper and Partnership Marketing programs. FERN GRANT, Executive Vice President, Commerce Strategy Practice Grant leads the agency’s commerce practice. A marketing strategist with a passion for representing the voice and experiences of real people, she has spent more than 20 years translating insights into strategies that drive growth. If you are looking for a strategic, execution focused, and cost-effective solution for your programming, come visit us at www.collaborativemktg.com. KRISTIN ISSLER, Senior Vice President, Client Leadership Issler manages the agency’s Metro NY offices and several agency teams, for clients primarily within the CPG food and beverage vertical. She has spent more than 18 years in brand management, integrated marketing and shopper marketing. DEREK JOYNT, Executive Vice President Joynt heads The Mars Agency Canadian operation and is responsible for driving growth for several of its North American client partners. He has been marketing to shoppers for more than 20 years. ROB RIVENBURGH, CEO, North America Rivenburgh leads the North American Mars Agency operation. With more than 25 years of experience on both client and agency sides, he delivers engaging, impactful brand experiences while driving growth for clients, employees and the community. 26 WHO’S WHO IN SHOPPER MARKETING AGENCIES BRIAN KITTELSON, Senior Vice President, Shopper Marketing and Commercialization Kittelson has more than 20 years’ experience in brand marketing and shopper leadership. Based out of Match’s Chicago office, he is working with teams across North America to build on and diversify the agency’s shopper marketing and e-commerce service offering. DAVID PAINTER, Senior Vice President, Managing Director Painter leads Mirum’s offices across Chicago, Los Angeles and Bentonville. He has extensive experience in partnering with clients to achieve their business objectives by creating solutions that drive customers to convert. GREG MCDONALD, Managing Director McDonald brings 20 years of sales, marketing and senior leadership experience from tenure at leading FMCG companies including AB InBev, Mars Inc., and Coca-Cola. He leverages shopper decision science to develop breakthrough strategies and integrated campaigns that drive conversion. GENEVIEVE RICH, Account Director Rich spearheads all 360-shopper marketing programming and strategy. Utilizing her creative thinking and psychology background to sincerely understand customer behavior, she brings new, exciting ways to engage consumers that drive results. MATTHEW RADER, Vice President, Brand Commercialization and Shopper Services With extensive experience in end-to-end ideation to commercialization, Rader creates full-funnel customized shopper and customer plans. He has led and worked on brands such as Schick, Thomas’, Nestle, Scotties, Santa Margherita, Skintimate and Edge. MIRUM SHOPPER JAY MATHEW, Chief Commerce Activation Officer Mathew has more than 20 years of experience in commerce and brand management. Mirum’s deep knowledge of digital, social and commerce helps it partner with its clients to transform their businesses. DAVID MAY, Senior Vice President, Sales & Marketing May leads the development of client relationships, market expansion, marketing and public relations. He is a team leader with vast experience in digital and social marketing, shopper marketing, commerce activation and business development. ANDREA MCGOVERN GALO, Vice President, Strategy Galo leads the strategy team to ensure that shopper insights are at the foundation of all of the agency’s work, and core to the development of the proper customer experience. BELINDA ROBBINS, Director, Special Projects Robbins delivers award-winning strategic thinking that enhances overall brand experiences for special projects. While leading the event team, she provides management and planning expertise from trade shows to large-scale events, like Walmart shareholders and charity events. NICOLE TRUDO, President Trudo strives for growth and innovation in everything she touches. With 20-plus years of experience, she has successfully molded MOjO Marketing as an industry trailblazer and currently leads the creative and strategic side of the business. ADAM WENGER, Director, Creative Services With more than 15 years of creative and design experience, Wenger leads the creative and innovation arm of MOjO Marketing. He specializes in art direction, brand immersion and visual merchandising to strategically place brand’s resources where they are most impactful. MOMENTUM WORLDWIDE SHAUN BROWN, Senior Vice President, Growth & Innovation Brown leads growth shopper development through big data, AI and digital shopper media. JENNIFER OLLIGES, Senior Vice President, Director of Shopper Marketing Olliges is a shopper expert leading the agency’s CPG clients and customerspecific shopper activation. GLEN PEDEN, Vice President, Group Shopper Creative Director Peden is the shopper creative leader for all national and customer-specific shopper activation. ADRIAN VELAZQUEZ, Vice President, Group Shopper Strategy Director Velazquez leads shopper strategy and shopper analytics. MOOSYLVANIA NORTY COHEN, CEO Cohen founded the agency in 2003 with a focus on motivating consumer behavior. MARY DELANO, Chief Marketing Officer Delano has spent more than a decade on the agency side of the business, connecting brands with their consumers, including Grey Goose Vodka, Bacardi Rum and McDonald’s, to name a few. MOSAIC SHOPPER DIANA ALLWEIN, Director, Client Services and E-Commerce Allwein is a seasoned client service professional with 20-plus years of experience leading successful campaigns for major CPG companies inclusive of digital and e-commerce. She’s a thought leader in the development and implementation of integrated marketing strategies and programs designed to engage the shopper. KRISTEN BUSS, Vice President, Strategy & Insights With more than 20 years in marketing, research, analytics, behavioral observation, and intuitively led brand, retail and creative strategy, Buss brings unique vision and innovative practices to the agency and their clients’ strategies. Her focus is on finding problems clients can uniquely solve, a strategy that serves the agency’s vision in purchase design. LIZ GAZAL, Creative Director Gazal has a passion for delivering smart behavior-based ideas that connect brands with shoppers in meaningful ways. With 15 years in shopper marketing, she leads a team of talented creatives to produce well-crafted and memorable shopping experiences with measurable results. BILL RODI, Vice President, Mosaic Shopper Operations Rodi leads Mosaic’s U.S. Shopper business, with an emphasis on growth strategy, business development and operations. He brings to the role deep, relevant experience garnered across similar client and agency-side leadership positions at Kraft Foods, Landor Associates, MSI, Schawk/ Anthem and GfK Consumer Brand Consulting. PARTNERS + NAPIER JULIE DEROLLER, Senior Vice President, Group Director, Vine Creative Studios DeRoller leads the agency’s Vine Creative Studios, developing customized retail solutions including POS and 3D rendering. Clients include Constellation Brands with more than 100 beverage alcohol brands such as Robert Mondavi Winery, Ravage and Casa Noble. CARA MITTLER, Account Director Mittler’s account leadership spans retail, CPG, food and beverage, and healthcare. Throughout her career, she has led integrated marketing campaigns for brands including Bausch + Lomb, Schuman Cheese (makers of Cello), Saputo Dairy Foods and Wegmans. GREG SMITH, Director of Retail Marketing Smith specializes in CPG, e-commerce and path-to-purchase marketing. He creates engagement plans that drive results and deliver ROI. He has led Effie-winning campaigns and retailer collaborations for clients including Nestlé, Heinz, Clorox and Saputo Dairy Foods. PHOENIX CREATIVE ABBEY ASH, Partner, Director of Shopper Marketing With more than 10 years of experience, Ash oversees the shopper marketing team. She’s a hands-on leader and growth driver for brands and retailers. DAVID DOLAK, Partner, Chief Creative Officer With more than 10 years creating results for clients including Mondelez International and Anheuser-Busch Inbev, Dolak leads a multi-disciplinary team at the agency crafting retail, CPG and shopper marketing programs from strategy to design to execution. Unraveling the Complexity of Today’s Commerce Through Collaboration Today’s “always-on” shoppers are changing how you do business. Join industry leaders as we uncover solutions and unite the community to meet the challenges of today’s commerce. EMMANUEL MARTIREZ, Creative Director Martirez’s insight and abilities have been helping Phoenix Creative win carts and minds since 2007. He has been instrumental in developing award-winning shopper marketing campaigns for brands including Sour Patch Kids and Halls. ABBY O’DONNELL, Account Manager From handling the dayto-day shopper business for the Mondelēz International account, to now leading the team, O’Donnell develops strategic marketing solutions that enhance brands and drive shopper behavior in the retail space. PROPAC AGENCY CHARLES DAIGLE, CEO & Founder See profile on page 18 CHASE DAIGLE, Director of New Business Daigle leads Propac’s growth strategy and business development. He applies his skills in promotions, shopper marketing, digital, entertainment, sales incentives and experiential marketing to clients including Mountain Dew, Interstate Batteries, Lipton, AMP Energy and Frito-Lay. GLENN GELLER, Director of Planning and Insights Geller leads Propac’s strategic link between the client’s business, consumer insights and creative executions. He is a powerful storyteller who illuminates possibilities for brands and backs them with solid marketing strategies. KELLY WELCH, Group Creative Director Welch and her creative team at Propac deliver strategic ideas through integrated branding, shopper marketing and promotions for billion-dollar retailers and CPG brands. Her team’s inspiring work has received numerous awards for creativity and effectiveness. PURERED RACHAEL BOONE, Chief Strategy Officer Boone, a Harvard grad, spent more than 20 years in management roles at Procter & Gamble, Johnson & Johnson, and ConAgra focused on identifying business growth opportunities through intimately understanding consumer insights. KEVIN KINCAID, Senior Vice President, Account Services A PureRED veteran of more than 20 years, Kincaid is responsible for growing the agency’s West Coast presence and managing its San Francisco office. GEORGE RUSSELL, CEO Russell started his career at Young & Rubicam on the J&J and Kraft General Foods accounts; Gillette where he directed marketing for the blades and razors business; Warner Lambert where he led the turnaround of Schick and Wilkinson Sword. He has served as Chief Operating Officer of Duane Reade Drugstores. CHIP WEINSTEIN, Managing Director, Consumer Growth Weinstein brings two decades of experience in securing new business for best-in-class advertising agencies, coupled with a deep level of expertise in digital, data analysis and CRM, in a multitude of business categories. He has held executivelevel roles at Publicis Dialog, Edelman, Whittman-Hart and Hill | Holliday. RED FUSE COMMUNICATIONS CAITLIN BISKUP, Associate Account Director, Shopper Marketing, North America Biskup is responsible for shopper marketing on the Colgate-Palmolive business across the U.S. and Canada for three categories: oral care, personal care and home care. RODGER DIPASCA, Global Managing Director, Shopper Communications DiPasca leads all worldwide shopper communications at WPP’s Red Fuse, a “team agency” that creates integrated marketing communications for ColgatePalmolive. DOMINIC FORTE, Associate Director, Shopper & E-Commerce Media, North America Forte is responsible for shopper-targeted media planning and buying throughout North America. ALLYSUN LUNDY, Group Account Director, Shopper Marketing, North America Lundy leads Red Fuse’s shopper marketing efforts for Colgate-Palmolive North America. SANDBOX GEORGE BIRD, Director of In-Store Experience From analog to digitally human experiences, Bird is able to concept and deploy beautiful, relevant and engaging experiences across popups to store-within-a-store formats. He ensures the experience always drives return for the brand while being relevant to the shopper STEVE SPENCER, Executive Creative Director Spencer makes the complex look, feel, sound and act simple. He hones the experiences and expressions of a shopper’s journey to combat decision fatigue and increase decision simplicity, purchases and loyalty, creating deep retail engagement. NICOLE TURNER, Senior Vice President, Client Service Whether brick-andmortar, e-commerce or one-off events, Turner helps brands capture, captivate and convert shoppers through meaningful and memorable engagement at every stage of the shopper’s journey. ETHAN WHITEHILL, Managing Director From shopper psychology and experiential design to brand strategy and activation, Whitehill has yet to cross a realm of retail territory that is unfamiliar, ensuring brands’ experiences and expressions are relevant, relational and provide return. RYAN KARLSTROM, Group Account Director Karlstrom is a proven leader of strategic partnerships. His drive and 18 years of experience combine to deliver optimal results for many clients including Dean Foods, Walmart, Ubisoft, MoneyGram, Organic Valley, Nestle and PepsiCo. EMILY BRATTON, Digital Director Bratton is a former web developer and associate director of creative communications at Wake Forest University. At SFW, she oversees a team of developers, strategists and content producers responsible for the agency’s digital activation projects. DAVE GEREN, Executive Vice President, Director of Accounts A former Lowe’s vice president of marketing, Geren has 20 years of experience in strategy, branding, retail marketing, CRM and multichannel communications on both the client and agency sides. He heads up the SFW research and account teams. GED KING, CEO Taking the reins of the agency his father founded, King brought more than 20 years of advertising, marketing and branding experience to the table. He transformed the small company into the area’s largest privatelyowned marketing agency. MATT KING, Chief Marketing Officer Joining the family business in 1996, King worked his way through accounting, account management and sales positions at SFW. He currently helps manage major creative projects, develops key client strategies and oversees new business development. SHOPTOLOGY CHARLIE ANDERSON, CEO Anderson has awardwinning years of shopper marketing experience leading innovative work with partners like PepsiCo, Walmart, Ubisoft and Kroger. His talented team is focused on insightdriven buy moments; seamless shopping; and tech-enabled shopping experiences. WILL CLARKE, Senior Vice President, Head of Creative With more than 25 years of retail and marketing experience, Clarke lives on the edge of retail, technology and brand storytelling. His work has been recognized by Cannes Lions, The One Show, Creativity and The Wall Street Journal. JULIE QUICK, Senior Vice President, Head of Insights & Strategy Quick is passionate about what drives shoppers in their purchase journeys and what bonds them to brands. Better service, bigger inventory and lower prices make Kinter the easy choice for all your retail display hardware needs. Complex orders, last minute orders and product customization are no problem. Whatever your retail display hardware challenge, call 800.323.2389 and we’ll solve it. 800.323.2389 | kinter.com Kinter is a family business obsessed with making retail display hardware easier for our customers. SOCIAL FORCES ARI ROTHMAN, Vice President, Account & Marketing Services Rothman is a 20-plus year CPG and retail veteran with account experience in integrated social media platforms who now leads new business development at the agency. CARL VERVISCH, President/Creative Director and Founding Partner Vervisch directs operations, finance and champions the ideas that will deliver a meaningful social experience through cohesive brand messaging and delicious visual design. KATE WHATLEY, CEO and Founding Partner Whatley leads the account team in all of the agency’s client-facing relations, specializing in strategic planning on digital initiatives and social shopper marketing program activations. RACHEL WILLIAMS, Account & Media Strategist Williams is an experienced digital media buyer who ensures brands’ goals, targets and campaigns are utilizing strategic content and audience insights for maximum results. THE SUNFLOWER GROUP/EVENTUS DEE HALL, General Manager With more than 30 years of experience in advertising and experiential marketing, Hall’s background includes agency ownership and executive leadership across multiple disciplines and industries. She leads consumer experiential marketing services across Kansas City, Miami and New York. THEORY HOUSE JIM CUSSON, President Cusson leads the retail marketing agency that supports some of the world’s leading retailers and brands, including Pepsi, Google, Lowe’s and Starbucks to concept and design remarkable brand experiences at retail. MOLLY KRAUS, Vice President of Account Services Kraus heads the client services team at Theory House supporting clients like Delta Faucet, Pepsi and Starbucks. JARED MEISEL, Managing Partner, Shopper Marketing Meisel helps clients create digital and physical experiences that connect with shoppers in relevant, profitable ways. TPN SARAH CUNNINGHAM, Senior Managing Director, Client Service & Development Cunningham has 20plus years of shopper and retail commerce and brand engagement experience, creating strategic solutions to make the buy happen for clients in the CPG, consumer electronics, telecommunications, apparel, digital and credit services industries. She leads TPN’s Midwest and West Coast offices, along with growth and content initiatives. Her leadership has helped major brands deliver robust omnichannel communication platforms, create breakthrough partnerships with top retailers Walmart and Target, and innovative shopper experiences. RICH FEITLER, President Feitler is a “big picture” guy. Under his leadership, TPN has 30 years of making the buy happen with and for iconic brands and world-class retailers. He continually pushes TPN to deliver commerce with imagination, working directly with agency and client leaders to foster collaboration and creative thinking. ALLY HOLLAND GILL, Senior Vice President, Account Service Gill has 20 years of marketing experience across all retail channels. Her core experience is in shopper marketing and annual customer planning, with a strong background in national brand activation and promotion. She plays a leadership role in the agency’s Hershey relationship. COLLEEN KELLY, Senior Vice President, Planning A leader in TPN’s Planning and Perspectives practice, Kelly brings more than 15 years of experience developing brand and shopper marketing strategies for award-winning programs for iconic brands in the Hershey’s, PepsiCo, Nestle and P&G portfolios. She champions strategy that directs creative, content, activation plans and messaging to instigate behavior change along the entire path to purchase. CHRISTY O’PELLA, Senior Managing Director, Dallas O’Pella oversees TPN’s Dallas and Bentonville offices as well as several of the agency’s largest accounts. With 25 years’ experience, she is a recognized expert in building CPG shopper marketing processes and initiatives, and retailer and consumer activations for some of the world’s most iconic brands. CHERYL POLICASTRO, Managing Director, Planning Policastro is head of strategy and insights for TPN and brings 25-plus years of experience in brand management, shopper marketing and analytics. Most recently, she led shopper marketing efforts for RB. Previous roles also included 14 years at Novartis Consumer Health, where she led healthcare initiatives for insights, analytics and grocery shopper marketing. CHRIS RUECKERT, Vice President, Account Service Rueckert is instrumental in developing insights-based shopper marketing and retail programming for Clorox’s national retail accounts and national shopper marketing group. In her tenure at TPN, she has successfully spearhearded innovative programs spanning across the Clorox brand portfolio of brands. Prior to TPN, Rueckert defined and led successful marketing programs for Visa, PlayStation and Comcast. JOE SCARTZ, Chief Digital Commerce Officer Scartz is responsible for leading the agency’s growing digital marketing, commerce and technology team, along with its Velocity Commerce Group, a commerce consulting practice dedicated to success on pure-plays, Amazon and omnichannel retailers. This focused group is connected to the broader digital commerce group, but operates with a special focus on driving Amazon business results for key CPG manufacturers and tech companies. TRACYLOCKE HUGH BOYLE, CEO Boyle has led TracyLocke through a four-year period of sustained growth and expansion. Throughout his career he has always believed that the retail environment provides brands a unique opportunity to innovate with new technology and creative thinking to truly express themselves to today’s shopper. MIKE LOVEGROVE, President and Chief Creative Officer The architect of TracyLocke’s Buy Design methodology, Lovegrove’s leadership and creative vision have been a driving force in uniting the power of data science and design thinking to create global brand experiences that not only exceed expectations, but capture the imagination. CAROL PERNIKAR, Executive Planning Director For more than 20 years, Pernikar has crafted award-winning strategic shopper strategies in CPG, beverages, pharmaceuticals, retail, financial and tech for renowned clients such as SC Johnson, Kellogg’s, P&G, Visa, Pfizer and HP. NANCY SHAMBERG, Managing Partner Shamberg is a big believer in the science of boundary-less shopping and the use of data to exceed expectations as shoppers travel between the digital and physical worlds. TWINOAKS BRIANNE BRANNAN, Senior Vice President, Client Leadership With more than 15 years of agency experience, Brannan has a passion for creative problem-solving and building strong team and client dynamics. She currently leads the client leadership team across the TwinOaks offices. CAMERON CLEMENT, Vice President, Executive Creative Director Utilizing his broad experience and passion in brand and shopper marketing, Clement directs creative communication strategies designed for problem solving and market success, focusing on innovative ways to influence purchase behavior, grow brand connections and build expectations. STEVE DEVORE, President DeVore has spent two decades on the agency side with a majority of that time in shopper. He partnered with Ken Barnett to launch TwinOaks in 2011 and has since built an agency with world-class creative that supports some of the biggest CPG companies in the world, including Beam Suntory, Beiersdorf and Coca-Cola. JASON STEWART, Executive Creative Director With 17 years in shopper marketing, Stewart is an award-winning executive creative director passionate about smart ideas and growing creative talent. He currently leads creative teams in Bentonville, Dallas and New York. UPSHOT JEFF DANIEL, Vice President, Media & Analytics Daniel is a true media maven at the forefront of shopper marketing media. He’s an expert at crafting media programs and go-to-market strategies that engage shoppers, while building brand awareness and driving sales. LISA HURST, Senior Vice President, Account & Client Management Hurst is a passionate leader who’s worked in shopper marketing from the start, with pioneers like P&G. She’s actively involved in growing Upshot’s shopper capabilities, bringing expertise and thought-leadership to shopper insights, strategies and experiences. BRIAN PRIEST, Senior Vice President, Creative Services Priest is a creative visionary who captivates and persuades shoppers by integrating brand building, shopper marketing and design. He creates orchestrated communications and intuitive experiences that deliver on the demands of today’s omnipresent shopper. ELLEN SLAUSON, Executive Vice President, General Manager Slauson leads Upshot and believes in the power of shopper marketing to build brands. Her passion is helping clients grow by creating brand excitement with memorable moments that ignite conversations and inspire action. VISUAL LATINA GUADALUPE CANO, Owner Cano is a partner and driving force behind the agency. With 18 years of experience she is a veteran in shopper marketing, leading the operational side of the business while growing the agency roster worldwide. SANTIAGO KEMBER, Vice President, Planning Kember leads strategy and planning for the agency and brings 25 years of experience in shopper marketing and consumer behavior. He identifies key shopper insights to fuel the strategic thinking behind all marketing campaigns. LAURA KORCHINSKI, Vice President, Account Services Over the past decade Korchinski has worked on both the client and agency sides. She leads the development of client relationships and manages a team to deliver integrated shopper marketing campaigns across brands and channels. FELIPE VALLEBELLA, Vice President, Executive Creative Director Vallebella directs and oversees all creative services and vision for the agency globally. With 15 years of experience and a fierce passion for shopper marketing, he leads his team to produce strategic concepts and innovative ideas. VMLY&R JON BIRD, Chief Retail & Commerce Officer Bird has more than 30 years of experience in retail and shopper marketing in both Australia and the U.S. He leads the commerce practice at VMLY&R and is a regular speaker on retail trends. ANDREW HEDDLE, Group Director, Commerce Heddle has led e-commerce businesses in the U.S. and Europe since 2003. He built and ran Best Buy’s $300M third-party e-commerce business, including the marketplace on bestbuy.com. He runs VMLY&R’s direct-to-consumer commerce practice, serving major U.S. brands looking to go direct-to-consumer. LAUREN MILLER, Managing Director, Commerce Miller works with brands to develop new platforms, products and value propositions to meet the needs of customers in the ever-changing commerce landscape. She has spent the last two years working with Ford to reinvent the car shopping experience for its digitally savvy customers. DAN PEREIRA, Managing Director, Commerce Pereira leads VMLY&R’s U.S. e-commerce practice pulling commerce through the connected consumer experience. He has more than 15 years’ experience working within CPG across multiple disciplines. BY DAN OCHWAT n November 2018, Profitero’s Keith Anderson ran an e-commerce workshop in Chicago (the first of a branded “eCommerce Academy” with the Path to Purchase Institute) during which he proclaimed: “2019 needs to be the beginning of the supply chain era.” To his delight, entering the new year, he saw action being taken. In January, Procter & Gamble announced DS3, a lineup of eight liquid-free cleaning products for the body and home, including a shampoo, hand wash, toilet cleaner and surface cleaner. The water-less swatch products are 80% lighter and take up 70% less space, which greatly reduces its environmental footprint and is more efficient for e-commerce. About a month later, a coalition of high-profile CPGs teamed with recycling company TerraCycle to create TerraCycle Loop, an e-commerce platform that ships products in a reusable tote (as opposed to boxes) and inside reusable containers. A consumer at home gets her shampoo and, when finished, puts the empty bottle into the tote, schedules a pickup, and has that bottle cleaned out, refilled and redelivered. Not to say brands and e-retailers haven’t thought about reducing waste and being more economical before – Amazon and others offer a later delivery date of goods to save on fuel, for example, and there’s Brandless.com – but Loop and DS3 are examples of bold, new ideas coming from CPGs to address the issue of sustainability and the economics of e-commerce. This is an issue that Anderson and five other e-commerce thought leaders all stressed as important to the future of e-commerce. Here, they discuss “the supply chain era” and other key strategies. chain sales, with a conservative forecast to reach 25% by 2022, and this doesn’t factor in all of the unknowns driven by accelerated store closures and major retailer investments into e-commerce as we’re seeing with Walmart and Kroger, for example. STEVE KINSEY: The space is as exciting as ever. Consumer adoption is increasing. National omnichannel retailers are seeing strong results from the technological, organizational and infrastructure investments they’ve made in years past. NEIL ACKERMAN: Convenience, vast selection and competitive pricing have made e-commerce the most important transactional channel on the globe. Further, the very social nature of e-commerce transactions allows end-to-end, personalized, real-time influence across the population. ANDERSON: Today, e-commerce is in the awkward adolescence, or in the fourth or fifth inning. From 2012 to present, it’s been, ‘Let’s learn by doing, let’s hire people, introduce them to technology and process, put a focus on search, content, the digital shelf,’ but where the puck is headed, in my opinion, is toward more sustainable unit economics – economically and environmentally. most brands have their sales in the low, single digits, but I think this is the real opportunity and where I expect most growth to come from. JIM MORGAN: Online grocery is on an accelerated path to industry saturation. Within the next decade, 70% of consumers will be grocery shopping online. of marketing or sales – occasionally as its own strategic pillar or business unit – with dedicated or dotted-line support from operations, finance and IT. PERRY: Companies need to organize behind e-commerce crossfunctionally. It’s about enabling e-commerce evolution in talent, resources, innovation behind the Walmart team, the Kroger team, the Target team, the supply chain team and the packaging engineers, the finance and sales forecasting teams. Also, organizations need to implement an e-commerce leadership and talent development strategy internally. Many current e-commerce leaders feel alone and often discouraged as change catalysts. Where does e-commerce need to improve? Where do you see BOPIS (buy online, pick up in-store) or other alternatives going? and it can also be significantly more wasteful. You’re adding secondary packaging to minimize leaks or spills or to preserve freshness – all of those packaging considerations. You’re using a lot more carbon, getting the goods to and from people’s doorsteps, not only for the delivery but for the returns. MORGAN: You’re seeing brands fully aware of the unique challenges that come with selling online, everything from developing unique assortments to prevent price matching and channel conflicts to exploring online-specific packaging innovation to reduce shipping inefficiencies and increase margins however possible. ACKERMAN: Traditional brands must rethink and transform not just the marketing cycle but the entire supply chain to focus on what personalization and customization means to their consumers today and in the future at a cost that is affordable and scalable for the shareholders. margins in grocery and retail, the last mile is extremely expensive, and if you can pass that cost to the shopper, it starts making a lot more sense. KINSEY: Personally, I believe click-and-collect will be more industry changing. America is car dominant. MORGAN: I agree with Rakuten Intelligence, which predicts a future where 70% of orders are click-and-carry, and 30% are delivered. Delivery will dominate in cities where cars are more scarce. However, where gas is cheap and space is plentiful, BOPIS seems best positioned to reign supreme. PERRY: While I do believe BOPIS will grow, I do consider this to be a bridge or gateway drug of sorts for shoppers who need to grow more comfortable with the convenience before ultimately realizing even greater convenience from home delivery options, which will continue to grow in availability. As far as internal structures or alignment around e-commerce, has a key framework emerged? How seriously should direct-to-consumer be considered as a strategy? mortar retailing, there are scale-based advantages – bigger is better – but online there are structural disadvantages to being big. PERRY: The framework that I’ve seen be most successful has been creating a separate business unit focused on e-commerce acceleration with its own dedicated multi-functional support, and it’s own P&L and operating model. product category and brand. It’s a matter of when, not if. DTC not only enables the CPG to deliver to a time-starved, convenience-hungry, digitally savvy consumer, it also provides them with valuable first-person data. MORGAN: It would be much better utilized as part of a larger marketing or data initiative. For example, Bear Naked allows you to create your own granola mix from 50 different ingredients with help from IBM Watson to ensure a perfect blend. ACKERMAN: Specific to supply chain, DTC is challenged by marketing costs associated to gain consumer traffic consistently vs. a one-visit engagement, and the supply chain costs associated with making this business profitable. HAQUE: I saw a recent stat that only 6% of brands have a directto-consumer offering. I think it should be considered, but the strategy around the “why” should be clearly defined to set the right expectations. ANDERSON: DTC has its place. I continue to believe it’s an interesting, if not an essential element of a new brand launch, but it’s not going to get you to a billion-dollar brand in under five or SM seven years. Dan Ochwat, on the So-Lo-Mo beat since 2011, served as an editor of Shopper Marketing for nine years. Send comments and So-Lo-Mo news to solomo@p2pi.org. “For the Love of It,” a new global tag and platform Now United for PepsiCo and Pepsi, is drawing inspiration from for Pepsi. music. The cola brand is leaning on a pop group of 14 singers and dancers from 14 different countries called Now United to create a new Pepsi jingle for the campaign, influence new packaging and campaign artwork, and share digital content marked by #FORTHELOVEOFIT. Digital content will include a video of the band presenting the new jingle, and content will be shared by Pepsi and the group as they tour. Pepsi is also developing unique experiences at the events for fans to engage with that will create shareable content. Now United is the brainchild of Simon Fuller, the manager and man behind the Spice Girls. TikTok, a short-form video app, is gaining attention and users, videos and share. seeing an uptick of 30 million downloads in three months since being acquired by Chinese company ByteDance,, which merged TikTok with an already similar and popular app called Musical.ly. It helped to get a mention by Jimmy Fallon on “The Tonight Show.” The light-hearted app helps users make funny music-driven videos with background effects and filters, and then share them with their friends and followers. It also publicizes video challenges, letting users join in on the viral fun. Brands easily can join these challenges with influencers or perhaps present their own challenges to engage with consumers. Therefore, the app has a nice niche to take on Instagram and other social networks. There are no paid ads on the app currently. Redbox launched its first national campaign with two TV spots that also ran on YouTube and influenced social activity with memes and exclusive GIFs on Giphy.com, a popular site, mobile app and GIF aggregator. The first TV spot has garnered more than 600,000 views with its humorous take on a man who has hands for feet. He streams movies anytime over Redbox on his devices using his feet while using his regular hands for DVDs that he gets from the Redbox kiosk. The second video, a funny date night ad, has around 2,000 views. The comRedbox’s pany worked with Fusion92, Chicago, on the campaign. Mapping Autonomous checkout comtechnology. pany Standard Cognition, San Francisco, has acquired Explorer. ai, a mapping and computer vision company that will improve Standard Cognition’s mapping technology. The move adds more engineers to ramp up Standard Cognition’s cashier-less shopping technology. The autonomous shopping technology focuses on cameras with computer vision as artificial intelligence and indoor mapping plays a huge part. That’s what Explorer.ai has focused on, initially working on autonomous cars. The USDA officially approved the mobile phone approved. scannable bar code from Digimarc, Beaverton, Oregon, as a method of transparency on packages for foods that are bioengineered (also known as GMOs). The government recently regulated that foods containing GMOs must disclose as such. Digimarc’s digital watermark can be scanned by a smartphone in-aisle to inform consumers of the new standard, and it also works with the SmartLabel mobile app, which provides transparency on products as well. The marketing team for Sony Pictures’ “Escape Room” movie appropriately created banner ads that when clicked sent users into a 360-degree escape room – based on creepy rooms featured in the movie. Sony tied the interactive ads to a sweepstakes that was hosted on a microsite. Consumers could unlock clues in different rooms to win a trip to Los Angeles as well as a chance at $1 million. Sony worked with digital agencies Stradella ‘Escape Road and Pretty Big Monster, Room’ and VR/AR platform OmniVirt. engagement. Berkeley, California-based Grabango Cashierless is moving forward with its handscheckout free, cashierless checkout technology, technology. having signed four U.S. chains that they say serve more than 600 million shoppers a year and cover a combined 29 million square feet of floor space. The company uses computer vision cameras and machine learning to track a shopper’s virtual basket via her smartphone. Shoppers don’t need to scan a phone to enter, and after getting what they need, they can pay at checkout via the traditional way or through their synced up phone. Digital promotion company Voucherify is helping taxi companies battle ride-share companies like Lyft and Uber. The company worked with Atlanta-based iCabbi, a cloud dispatch platform that helps traditional taxis run mobile promotions, book rides via mobile and get more riders to pay for rides using mobile payment. Voucherify’s white label product integrated into iCabbi’s software, helping iCabbi find customers based on personal details and order history, and deliver nearby riders personalized deals or vouchers toward rides. The iCabbi app and technology support 70,000 vehicles, performing 3 million trips Helping traditional every week. cabbies. FRENDA: As you ascend to the second floor, you are greeted by one of several “road maps” that provide a guide to all of the departments. The store layout becomes a circle that is navigated in a counter-clockwise pattern. It’s fascinating in that it’s difficult to navigate if you try to not go with the flow. Between virtually all of the shoppers following the pathways and arrows (on the floor and overhead), you are caught up in what essentially becomes a treasure hunt for not only furniture and appliances, but for an endless array of tempting home accessories that are reasonably priced. FRENDA: When you enter on the first floor, you are greeted by an escalator and a single display model room that gives you a sense of coming attractions before you travel to the second and third floors, which contain room after room of inspiration. FRENDA: One of the extraordinary things about the staging of the room displays is the comfortable look they achieve. You can imagine yourself making yourself right at home. I saw that in many of the displays as shoppers were relaxing as if they were in their own houses. Note that in this example, the signage is prominent and easily understood. This “dream room” at $1,446 includes sofa, other furniture, mirror, lighting and draperies. FRENDA: Here’s an inspiring display of what a closet/sitting area might look like in a loft setting. Impressive how nothing is left to chance in the design of these IKEA mini-showrooms. FRENDA: In addition to the many bedroom, living room and office settings displayed, there were a dozen kitchen settings with cabinetry, appliances, lighting and decor for sale. Each display room is impeccable and inspires the creativity you can examine for your own house. FRENDA: As you can see from this image, relaxing on the furniture is a customary part of the shopping experience. In the seasonal department, a gorgeous array of garden furniture tantalizes shoppers as they look forward to breaking winter’s grip. FRENDA: Upon touring the beautifully designed rooms, which alternate with the promoted household decorations, you are struck by the spectacular color combinations that make you think of your home design in inspired ways. In each case, there is an item that is featured as a great value. In this case, it is the cushions for $4.99 on the shelf and in bins. FRENDA: Here is another beautiful display of decorative throw pillows. The orange “NEW” promotion was used 25 times across the store for featured items. Note the great lighting effects that are used for each of the displays that dot the circular walkway referred to earlier. In touring the store you don’t miss one tempting display to fill your basket. IKEA is a furniture store chain from Sweden, and about 10% of its 424 stores are located in the U.S. These are incredibly large, highvolume stores that make IKEA the largest furniture retailer in the world. While the chain operates in 52 countries, it’s likely that many of you reading this have never been in one of its stores. Based on my visit, in addition to experiential, I would add the superlatives of inspirational and colorful in describing the store. And talking to a few shoppers, there’s a perception of great value. I estimate the Schaumburg store to be roughly 350,000 square feet, with two upper levels featuring furniture, kitchen appliances and home accessories on display, while the lower level is set up as a warehouse that contains much of the ready-to-be-assembled furniture. On the Friday afternoon I visited, the store seemed quite crowded in spite of its massive acreage. FRENDA: One of the gathering places or destinations at IKEA is the Restaurant & Cafe in the middle of the second floor. The line was impressive and there is seating for about 250 people in this very busy part of the store. 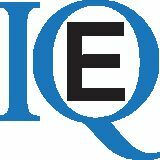 advisor for EnsembleIQ and the Path to Purchase Institute, has been a passionate retail watcher for more than four decades. Having worked as a retailer, for a brand manufacturer and in the infotech world, he is an authority on the entire path to purchase and its changing face. Contact Steve at sfrenda@ensembleiq.com. ACTIVATION GALLERY Super Bowl/Football Mondelez International teamed with Coca-Cola Co. for a football-themed floorstand at Kroger depicting Coca-Cola beverages with appetizers using Mondelez’s Ritz and Triscuit crackers. Stocking only the cracker SKUs, the display communicated an “enjoy unrivaled favorites” message and directed users to Pinterest. com/Nabisco for recipes. Beam Suntory tied in to the “Big Game” with an endcap header at Meijer positioned above case stacks of Pinnacle vodka, Jim Beam bourbon and Hornitos tequila. The header shared recipes for game-day-themed cocktails. Herr’s Food earned prime positioning in Albertsons Cos. chains, particularly Acme, deploying football field-themed spectaculars with “hard hitting flavors” messaging as well as a “Crunch Time” header that depicted goal posts with an oversized football helmet at the top. General Mills deployed a flashy “Gameday Greats” pallet display at Stop & Shop that united General Mills brands Chex Mix, Chex, Old El Paso, Nature Valley and Cheerios. Mars Inc. activated its official NFL/Super Bowl sponsorship for a variety of fourway signage and half-pallet displays at Walmart. The creative messaging invited shoppers to “bring ’em in for the win,” with specific execution ranging from one display inviting shoppers to “kick off the season” in the fall to another tying in to the retailer’s “Game Time” platform in advance of the Super Bowl. At Winn-Dixie stores, PepsiCo/Frito-Lay activated its official NFL/Super Bowl sponsorship with prime merchandising space throughout the store, including on a vintage, football-themed floorstand stocking old-school Pepsi cans near beverage as well as spectaculars near store entrances promoting its national “Buy, Play & Score” campaign and stocking a number of beverage and snack SKUs from the manufacturer. Pfizer’s Nexium activated its tailgatingthemed platform for Walmart. Shelf trays inviting shoppers to “tackle heartburn” plugged $2 in savings and a text-in sweepstakes awarding Walmart gift cards. Path to Purchase Institute members can view many more Super Bowl/football-related photos in the image vault at P2PI.org. PepsiCo elevated its beverage portfolio throughout the football season at Walmart. Among the activity was regional signage (including window posters and bollard wraps) in Georgia touting Atlanta as the Super Bowl location and presenting Pepsi as the game’s official soft drink. Snyder’s-Lance’s Cape Cod drew the eye of Walmart shoppers with a half-pallet display delivering recipes for a variety of dips (“spicy parmesan and onion,” “5-minute cheddar bacon ranch,” and “warm rosemary ricotta”) positioned as healthier alternatives. Mondelez International’s Oreo leveraged its highly adaptable “cookie balls” theme at Walmart to present football- and helmetshaped takes on the dessert recipe on a custom, half-pallet display depicting the retailer’s official “Game Time” seasonal logo. bring better decision-making, higher returns on investment, improved efficiency and lower turnover. One report – by Lehigh University’s Corinne Post and Georgia State University’s Kris Byron – found that women tend to think more broadly and holistically and companies with women board members are more socially responsible. When that type of thinking is brought to the boardroom, decision-making implications for employees and the communities where companies do business are more likely to be given a voice. Women’s preparedness – fueled by feelings that their qualifications may be questioned – has an effect on male board members, Post told Forbes.com. “When women participate on boards, the attendance of male directors goes up too,” she said. “There might be some type of contagion effect where if women come better prepared, then everybody starts preparing better. That can help in making better decisions overall.” PRESSURE FOR PROGRESS At the current rate of progress, though, true equality at the senior level is decades away. The glacial movement is caused, in part, by the many men and women who are satisfied with so little progress. Nearly half the men and a third of the women surveyed for McKinsey’s Women in the Workplace 2018 study believe women are well represented at the senior level when they fill just one in 10 roles. Erich Fritz was named executive vice president and chief supply chain officer, Jordan Greenberg was named EVP and chief commercial officer and Ellen Schum was named EVP and chief customer officer. Vanessa Maskal, EVP of sales and marketing, recently retired from the company. to vice president of analytics and business performance management. In this role, Krupa leads the group’s analytics team in providing clients accurate visibility into their shopper marketing program results. Under Krupa’s leadership, the organization has increased its analytic offerings by developing a cloudbased analytics platform applying best-inclass business intelligence. Read Avid’s “Who’s Who” profiles on page 16. Director of manufacturing Doug Harris was named vice president of manufacturing effective May 1. In his new role, Harris will oversee the efforts of Publix’s manufacturing businesses, which include seven fresh production plants and printing services. Harris began his Publix career in 1998 as an industrial engineer in Lakeland, Florida. He worked in various positions in logistics within manufacturing before transferring to the Atlanta dairy plant in 2006 as a production operations manager. In 2013, he was promoted to general manager of the Atlanta dairy plant. Harris transferred back to Lakeland last year, when he was promoted to his current role. Eric Roth was named an account executive. Roth has more than 16 years of in-store merchandise and P-O-P experience. He has partnered with industry-leading global brands to create eye-catching, experiential marketing campaigns that target clients’ needs and help give businesses an edge at retail. Roth has extensive knowledge of branded retail environments, full-store rollouts, electronic kiosks, individual display programs and everything in between. leadership and development of the talent, work and culture, Collins plays a key role in the growth and commercial success of the Midwest region. Showcasing Momentum’s continued dedication to expanding its footprint across the region, Collins also has oversight of the St. Louis operation and is responsible for driving the growth and commercial success of that office. He reports directly to Donnalyn Smith, Momentum president, North America. Chief operating officer John Kellogg succeeded president and CEO Joe Baksha after Baksha concluded a 50-year career in the industry. Kellogg joined OSI Creative as chief operating officer in October. He has 28 years of experience in the printing, packaging, distribution and display industries. Kellogg has extensive experience in building effective teams, differentiating product offerings, creating rapid and scalable growth, private equity, and mergers and acquisitions. Baksha’s career includes decades of experience in executive positions with companies providing supply chain management solutions for displays, promotions, consumer products, printing and packaging. Adeel Najmi and Rahul Bhattacharya were named chief product officer and chief analytics officer, respectively. Najmi and Bhattacharya bring with them close to 50 collective years of experience in consumer goods and retail execution. The two will work alongside CEO Steven Hornyak to deliver AI-enabled solutions that empower CPG companies to improve revenues and margins through more robust, complete analysis of real-time data. Horizon Media, New York. Horizon will combine data and technology to deliver fully integrated media planning and buying across paid channels, and strategic integration with the retailer’s new creative agency of record, Los Angeles-based Anomaly, as well as Chicago-based Edelman, Petco’s PR agency of record. Anomaly is charged with delivering bold creative ideas and counsel on Petco’s omnichannel and consumer engagement strategies, with a targeted focus on digital – where change is also taking place. Most recently, Petco absorbed the Drs. Fosters and Smith e-commerce business it had acquired in 2015 into Petco.com. Founded as a mail order seller of canine medications, Drs. Fosters and Smith at the time of the acquisition had grown to be one of the largest online pet retailers in the U.S. The change streamlines operations to allow Petco to better focus on its core business, and the retailer is continuing to offer home delivery of pet prescriptions though a new alliance with healthcare company SM Express Scripts. Proudly part of Stronghaven, Inc. and the Hood Container family of companies. Large to small, we stock them all!